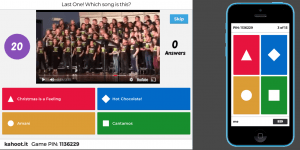 Blog Revisited: Ten Tech Tools to Assist an Elementary Music Teacher – #6 Kahoot! Up next in this countdown is Kahoot! a free game-based learning platform. It is comparable to a quiz-type game show. Numerous music educators have successfully used this in their classroom for assessments and as a day-before-break activity. Kahoot! is free and can be used by creating a free account. Once your account is created, you can search their database for games that have been created by other music educators. 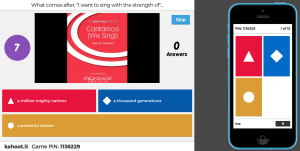 For example, when I click on “Find Kahoots!” and input “music” into the search bar, over 42,000 games show up. When I input “recorder music”, over 3,000 results appear. If I click on the title of the quiz, the questions appear for me to check out if this is a Kahoot! quiz that I would like to use with my students. If I would like to use his Kahoot!, I will click the three dots and scroll down to “Preview”. This allows me to try the quiz before I use it in class with the students. If I click the star, I can add this Kahoot! to my favorites to easily find the next time I login. 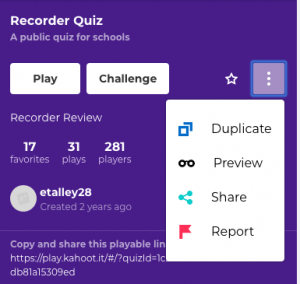 Update: You can now create Kahoots! with the mobile app. Click here to learn how! When I click “Play”, the quiz appears with some options. I can go with the default options or customize them for each class. I tend to go with the default. However, the students love Kahoot! quizzes and games so much, that I will change the options around when they play it for the second time. Kahoot! has individual or team modes. Which one you choose depends on your goal and your devices. If you have a few devices and this is not a station in your classroom, then the team mode might be more optimal. The team can share the device. If you have 1:1 devices, then the individual mode might be more desirable. One tip: If you suspect that your students cannot write appropriate names when they login, then click on the Name Generator. Kahoot! supports numerous devices. For my 3rd and 4th grade students with chromebooks, I place the https://kahoot.it/ link in their google classroom. They go to their google classroom, click on the link, and input the game pin (the pin is automatically generated when you choose individual or team mode). For my 2nd graders, I have the Kahoot! mobile app on their iPads. The app is for iOS and Google Play. The students can click on the app and input the pin. 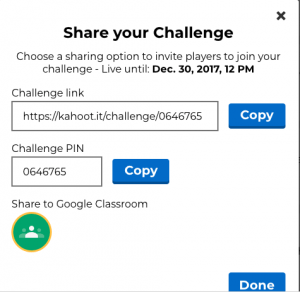 You can create a Kahoot! challenge as a homework assignment. When you are in the Kahoot! 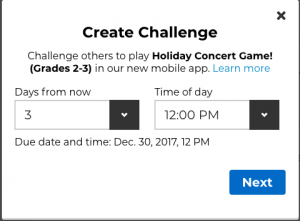 quiz you want to assign, click the “Challenge” button instead of the “Play” button. Input the due date for the challenge. Copy the link and game pin and place it on their google classroom, Seesaw, email, etc. When your students have played a Kahoot!, it will show a podium with the top three high scores and scorers. A few minutes later, you will receive an email with all of the results. You can also access the results from your account. The results can be downloaded as an excel file or it can be saved into your google drive. I love using Kahoot! to quiz the students on the concert lyrics. To do this, I create a new Kahoot! quiz. I use graphics and snippets of youtube videos to enhance the questions. For example, you can input a youtube url of a video of a song that they are singing and easily edit the video within Kahoot! With Andy Beck’s song, Hot Chocolate, I used a youtube video where I only showed the body percussion part and asked them if they could name the song. In other questions, I wrote out one line and then gave multiple choice answers for the next line. When the students are answering questions, the game will play until everyone has answered the question. It will show which student is in the lead. The students will also see their results on their devices. Tip: During the quiz, at least once, a student will be logged out. I always have the game pin displayed (you can click on that in the options) so that the student can log back in. Tip: For tips on creating a good and effective Kahoot!, check out this blog post. Only One Device in the Classroom? If you have one device in the classroom and would like to assess, I would highly suggest plickers. I have used this successfully with younger to older elementary. 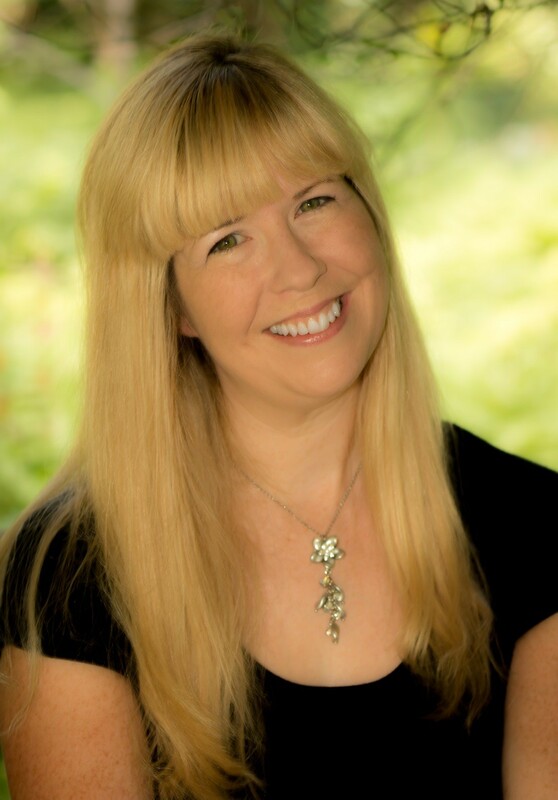 This countdown will lead to a new webinar showcasing all ten (maybe eleven!) tech tools!